Shot on what I suspect was dual 5Ds or 5DsR cameras, and stitched together for 16K timelapses. 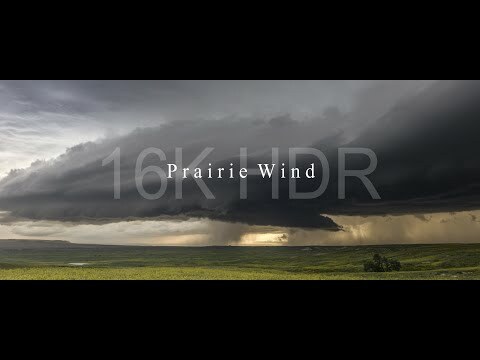 ARLINGTON, Texas - Producer, director and cinematographer Martin Lisius, best known for his high-end weather productions, has just released a new short film titled, “Prairie Wind,” a production he shot on 16K video. His decades-long passion has made him one of the top natural history shooters around, and led him to create StormStock in 1993, an award-winning collection of severe weather footage licensed for use in movies, commercials and documentaries. “I’ve captured hurricanes, tornadoes, and lightning on Super 35mm motion picture film, 4K and even 3D. I wanted to try something different, something more immersive. I knew I could build a 16K camera system, I just didn’t know how good the results would be until I tried it,” he said. Early this year, Lisius acquired two high-resolution Canon stills cameras and attached them to a custom-designed mount and began test shooting. The images were carefully stitched to create one, seamless 16K image (15,985 x 5792 pixels). Once he succeeded with testing, he headed out to the Great Plains and drove from Texas to Nebraska last spring in search for supercells, the rarest and most powerful of thunderstorms. Post-production on “Prairie Wind” began in early August and consisted primarily of stitching and rendering the 16K video clips which are as long as 700 image sets each, or about 23 seconds in duration. “We did some research and it appears this is the first film shot completely on 16K anywhere in the world. Even though the ability to view on 16K doesn’t exist yet, the technology to shoot it does with the release of this film. The advantage of 16K is it provides a massive canvas for tremendous flexibility in post-production, and it looks quite marvelous on 4K and 8K,” said Lisius. “Prairie Wind,” a 4-minute tribute to the skies over America’s Tornado Alley, can be viewed on HD (for those with HD or lower displays) at https://www.youtube.com/channel/UC84DIC1kVAwB0HoUgrSMd5w, or up to 8K at Vimeo https://vimeo.com/martinlisius/PrairieWind16K.